Kristen VanderVeen and Bull Run’s Eternal. 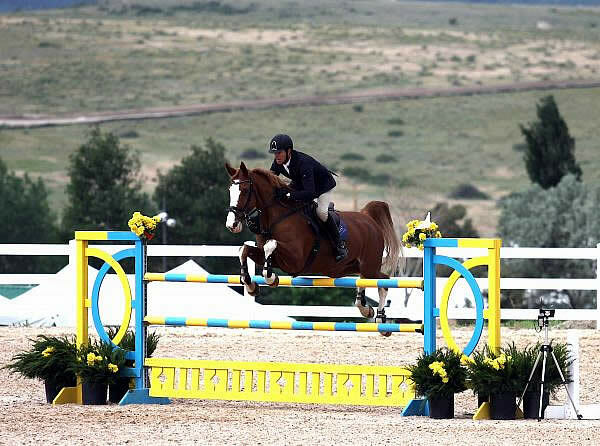 Parker, CO – July 13, 2013 – Brazilian course designer Anderson Lima built what appeared to be a straightforward course for the $40,000 Holiday Inn of Parker Grand Prix for Summer in the Rockies V, considered the peak week of the summer series at the Colorado Horse Park. But the course was tougher than appearances let on. The time allowed was tight. Some of the first few horse and rider combinations fell victim to time faults, like Alex Grenato and Page Tredennick’s Mullaghdrin Rado, who were second in the order. The pair was clean but one second over the time allowed. The riders later in the order learned that it was necessary to be forward. A total of 34 horse and rider combinations took on Lima’s course with the goal to return for the jump-off round. Karen Cudmore and Blair Cudmore’s Ceonto were the first to have a clear round within the time allowed, immediately followed by Chris Killiam and AEM Enterprise’s Black Diamond. Eight rounds later, John Pearce and Johnny B Good, owned by Forest View Farms, were fault-free, followed by Schaefer and his own Caribe and then amateur Hope and Total Touch. Bryn Sadler and Bon Giorno, owned by Showcase 81 LLC were next to go clear, and Welcome Stake winners Granato and Page Tredennick’s Zenith Dance were clear as well. The third to last in the order, VanderVeen and Bull Run’s Eternal, and the last to go, Cudmore and Shea, joined the group headed to the short course. Schaefer and Caribe delivered the first double clear effort with their jump-off round timing in at 37.518 to give them the lead. Next, Hope and Total Touch produced another clear round over the short track in 38.728 to claim second place. Sadler and Bon Giorno also were double clear with a slower time of 41.608. 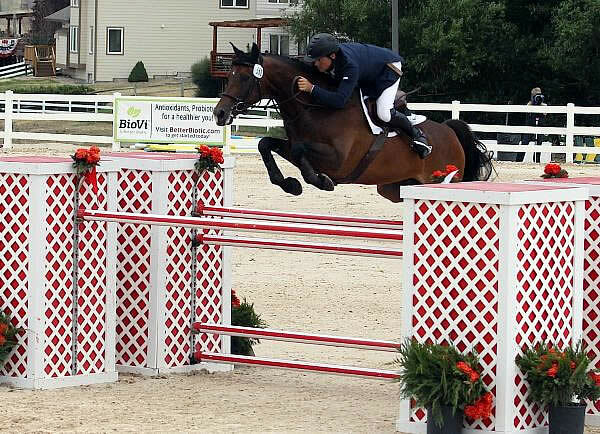 VanderVeen then piloted Bull Run’s Eternal flawlessly through the jump-off, stopping the timer at 36.812 to win the class. Schaefer moved to second place and Hope to third. Bull Run’s Eternal has been a consistent winner for VanderVeen. Click here for an online version of the prize list. For a hard copy of the prize list, please e-mail prizelist@cohorsepark.com with your name, address and phone number and specify which prize list you would like (spring/fall or summer). Mail to The Colorado Horse Park, 7522 South Pinery Drive, Parker, CO 80134 or fax to (303) 841-7879. Opening date for Stall Reservations: April 1, 2013. Closing date May 20, 2013. From North: I-25S exit Ridgegate Parkway – go east under the freeway. Ridgegate Parkway to S. Chambers Road, approx 3 miles (Traffic light) – turn right/south onto Chambers Road. At end of Chambers Road turn left/east onto Hess Road. Hess Road to Parker Road/Hwy 83 – turn right/south onto Hwy 83 approx 4 miles to Bayou Gulch Road. (Traffic light). Follow signs to Colorado Horse Park. From South: I-25N, exit Founder’s Parkway. Founder’s Parkway to Highway 86, approx 4 miles (traffic light). Turn east/left onto Hwy. 86 to Franktown/Hwy 83. At Franktown go north on 83 approx. 7 mi. to Bayou Gulch Rd. (Traffic light), turn right/east onto Bayou Gulch Rd. Follow signs to Colorado Horse Park. Kristen VanderVeen and Bull Run’s Le Conte. Parker, CO – June 20, 2013 – The $15,000 Open Welcome Stake was the highlight of the day in the Kathy and Brad Coors Family Grand Prix Arena at Colorado Horse Park’s Summer in the Rockies III. Kristen VanderVeen used Bull Run’s Le Conte’s huge stride to her advantage and eventually earned the victory gallop. Irish course designer Alan Wade built an intuitive, flowing course that tested the more experienced horse and rider, while allowing the less experienced horses and riders to move up with confidence. Twenty-two horse and rider combinations tried their hand at Wade’s track, and 12 earned the opportunity to compete in the jump-off round. The first horse and rider team to return for the short track was VanderVeen and Bull Run’s Le Conte. The round was smooth and effortless over the raised obstacles. The pair laid down a time of 34.623, which would stand as the fastest of the field and eventually earn them the win. Bjorn Ikast and Royal Flush had the next fault-free round with a time of 41.142. Then Amanda McConnell and Leon D’Or sped around the short course cleanly in 36.113, putting them in second place. Bryn Sadler and Bon Giorno and Matt Cyphert and Lochivar both went double clear with times of 38.376 and 38.670 respectively. Then, Ikast returned on the Summer in the Rockies II $15,000 Open Welcome Stake winner, Colorado, owned by Bovee Limited Liability Partnership. The pair left all the rails in their cups in a time of 38.051, landing them in third place. Earlier in the day, Kelsey Van Ackeren won the $500 High Junior Amateur Owner Jumpers aboard Vernon G, repeating the win form last week. Jennifer Hodgson and Waterloo II were second and Hannah Holik and Cupido de Laubry were third. Ackeren’s goal for the week is to be consistent in the High Amateur Jumpers. “It’s great that they have the $10,000 classics, because it’s big,” she said. 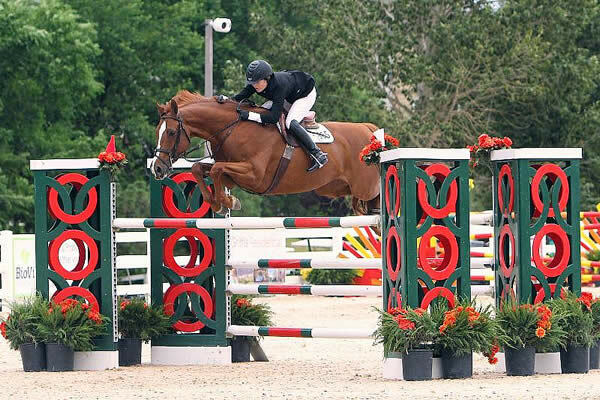 In the $500 Low Junior Jumpers, Chelsea Babcock and Bull Run’s Guardian, owned by Empire State Equine Sales LLC, proved their consistency and staying power. The pair won the $5,000 North American League Low Junior/Amateur Owner Jumpers during Summer in the Rockies II. Rising stars Isabel Johnson and Thinks Like a Horse’s Quito were second and Hannah Holik and Czech Mate, LLC’s Santiago were third. 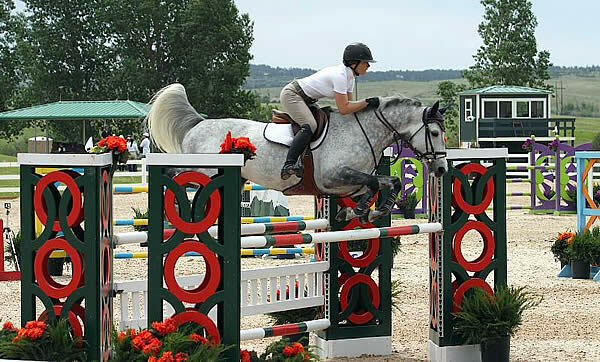 On Friday, Colorado Horse Park’s Summer in the Rockies III continues with $1,000 Young Jumpers 7/8 Year Olds, 1.30m and 1.40 Open Jumpers, High and Low Junior/Amateur Owner Jumpers and much more in the Kathy and Brad Coors Family Grand Prix Arena. Last week’s Grand Prix winners, John Pearce and Chianto. Photo by Carrie Wirth. 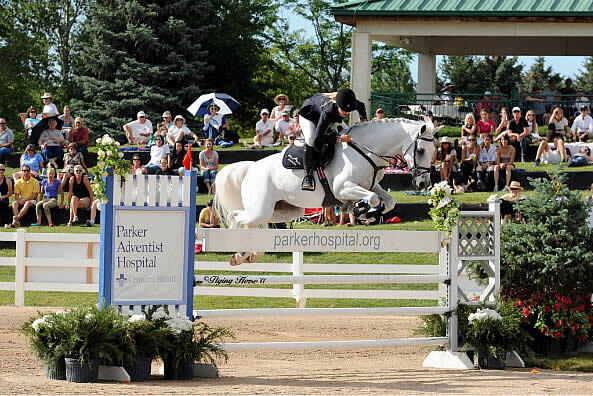 Parker, CO – June 15, 2013 – Summer in the Rockies II Grand Prix, presented by Littleton Equine Medical Center and Platinum Performance, was well attended and spectators lined the grass bleachers and VIP area on a mild summer day. Much needed rain could be seen far in the distance but Mother Nature held off the showers with perfect timing, letting go in a brief downpour as the victory gallop ended. Brian Curry, Vice President and General Manager of the Colorado Horse Park announced that the Black Forest area wildfire is now 45 percent contained. He led the audience in a moment of silence for the couple who tragically lost their lives in the blaze. 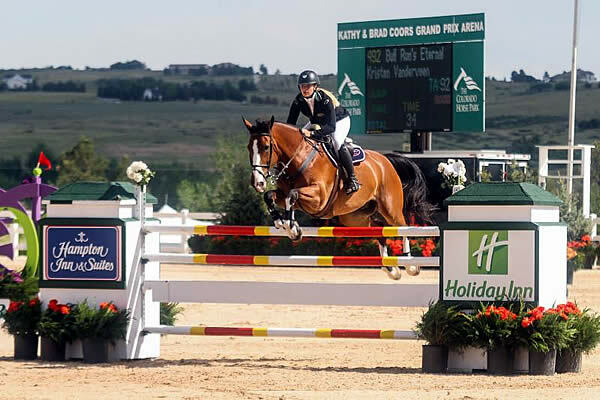 During the late afternoon event, 20 horse and rider pairs tried their hand at Danny Foster’s grand prix course in the Kathy and Brad Coors Family Grand Prix Arena at the Colorado Horse Park. Foster was pleased with the outcome of the Grand Prix and the course he designed. John Pearce had clear first rounds on all three of his entries: Son of a Gun, Johnny B Good and last week’s Summer in the Rockies I Grand Prix winner, and veteran grand prix winner, Chianto, all owned by Forest View Farms. Armando Hassey and Taggert Enterprises LLC’s Eminem also went clear to return. Bjorn Ikast had two fault-free rounds, first with his own Royal Flush and another with Bovee Limited Liability’s Colorado, winner of this week’s Welcome Stake. Bull Run’s Eternal with Kristen VanderVeen in irons, also progressed to the short track, skillfully executing the course while leaving all the poles in their cups. Foster’s jump-off course included some really exciting long gallops that kept the crowd of spectators on the edge of their seats. First back was Ikast aboard Royal Flush. The pair went clear and set the time to beat, 47.920. Next, Pearce and Johnny B Good accomplished another clean round in the time of 43.728. Then, VanderVeen returned on Bull Run’s Eternal and sped through the course deftly and faultlessly beating Pearce’s first round with a time of 42.084. Then it was Hassey’s turn aboard Eminem. The pair had a rail, and then opted to take it easy finishing the short course in 49.555. Colorado and Ikast followed suit, becoming the second four-faulter with a time of 48.382. It was up to Pearce to best VanderVeen’s time if he was to take the prize. He still had two rounds to go, one with the very fast Son of a Gun and one with his long-time partner Chianto. With Son of a Gun, Pearce was clean and fast with a time of 42.100, but not fast enough to beat VanderVeen. It now came down to his round with Chianto but it was not in the cards. Chianto had a rail at the first fence and had a time of 43.601. VanderVeen and Bull Run’s Eternal maintained the lead and earned the win. “He’s been money for me,” she said of Bull Run’s Eternal. “We imported him this winter and right away he was second in a class at WEF in Wellington. He jumped the night classes. I’ve never really gotten to do that before. He’s only 10 years old. I have high hopes for him. Kristen VanderVeen and Bull Run’s Revive’s winning style. 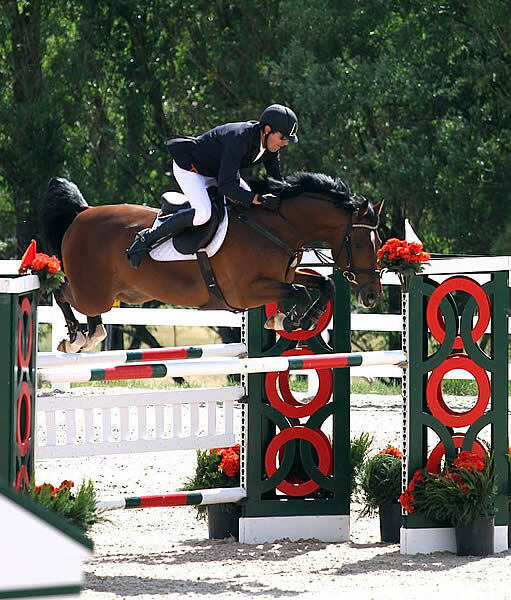 Parker, CO – June 14, 2013 – The third day of the Summer in the Rockies II was filled with exciting show jumping competition in the Kathy and Brad Coors Family Grand Prix Arena. In the $1,000 7/8 Year Old Young Jumpers, Kristen VanderVeen and Bull Run’s Revive repeated their victory from Week I by nabbing the championship once again. The duo executed Danny Foster’s course in great form, proving the talent of these rising stars. VanderVeen imported Revive as an approved Holsteiner stallion and later gelded him. VanderVeen said that her other two entries in the class are much greener than Revive. VanderVeen and Bull Run’s TMac were second in the class. She named the horse after a Christian band. Mercy Me, also imported by VanderVeen when the mare was 5, is another talented mount she has high hopes for a stellar career. VanderVeen will compete aboard two mounts in the Grand Prix on Saturday afternoon. Kelsey Van Ackeren from Austin, TX, won the $500 High Junior/Amateur Owner Jumper Class aboard the gray gelding, Vernon G. Van Ackeren racked in the ribbons today earning a second place prize in the Modified Junior/Amateur Owner Jumpers with Hey Joe and a third in the Low Junior/Amateur Owner Jumpers with Indian Creek’s Mighty Magic. Van Ackeren has had Vernon G for about a year and a half and it took a full year for her to find him. 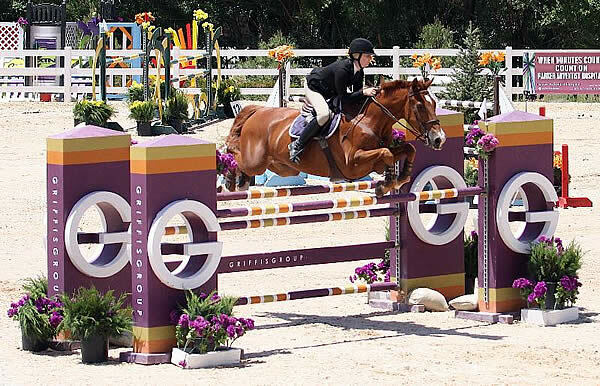 She finally hit the jackpot in Thousand Oaks, CA, where Kirsten Coe had been riding him. Van Ackeren, who rides with Matt Cyphert at the shows, will return for her sophomore year at University of Texas this fall. She plans to stay for the entire Summer in the Rockies circuit and will celebrate her birthday on July 9 at the Colorado Horse Park. Earlier in the day, Tony Font from Magnolia, TX piloted Deana Blackburn’s Kissimmee to the 1.30m Open Jumpers in the Kathy and Brad Coors Grand Prix Arena. In the 1.40 Open Jumpers, Bjorn Ikast and his own Iz’s Viva La Vida delivered an electrifying performance earned the pair the win just edging out Font and Calotta, owned by Ashton Galo Paley. Saturday show jumping action begins Saturday at 8 a.m. The not-to-be-missed highlight of the day is the $30,000 Summer in the Rockies Grand Prix Presented by Littleton Equine Medical Center and Platinum Performance held in the Kathy and Brad Coors Family Grand Prix Arena at 4 p.m.
Parker, CO — Kristen Vanderveen made her trip from Wellington, FL worthwhile when she capped three weeks in Colorado with a win in the $50,000 Parker Adventist Hospital Grand Prix. The six-week Colorado Summer Circuit ended with a bang, complete with Military Appreciation Day, a visit from Congressman Mike Coffman and the final distribution of nearly $1,000,000 in cash and prizes. The six-week extravaganza was highlighted by the $50,000 Parker Adventist Hospital Grand Prix. Featuring Olympians and World Equestrian Games-competitors, the class was part of an afternoon of entertainment that included Military Appreciation Day. “We wanted to support and recognize military families. They deserve our gratitude and thanks for their service. We are very happy to do our part by offering them the chance to relax and enjoy a pleasant afternoon with their families,” said Helen Krieble, The Colorado Horse Park’s founder and president. Veterans and their families were able to enjoy the horse show, along with activities for the kids that included bouncy houses and pony rides. Congressman Mike Coffman, a Major in the Marines, Retired, also attended.